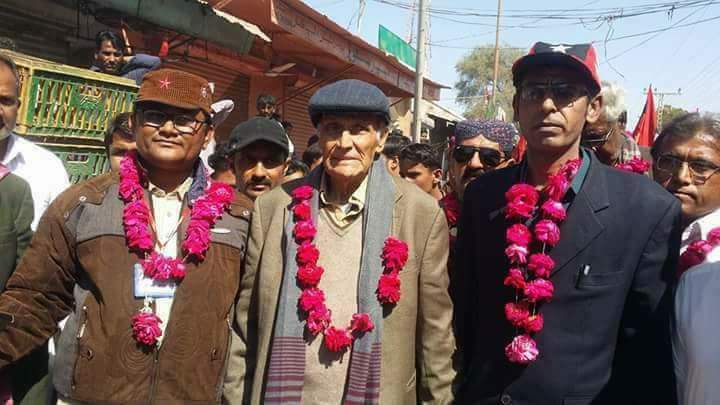 MITHI: Awami Tehreek chief Rasool Bux Palijo has warned Sindh’s rulers not to play into the hands of the mining company over the reservoir project in Gorano village and demanded shifting the site of the hazardous project to somewhere else far away from human settlements. He, however, made it clear that he and his party were not against development and prosperity in Thar and Sindh and cautioned if the reservoir was constructed at the proposed site it would wreak havoc with 12 villages in its surrounding area. He was speaking to villagers and party activists and talking to journalists in Islamkot on Saturday. The AT workers, including women and children, were embarking on a 32-day ‘long march’ from Islamkot to Karachi to draw attention to the party’s protest against the construction of Gorano reservoir, Zulfikarabad city and other such projects which were detrimental to the interests of the province and people, he said. He said that peaceful people of Thar region were being forced to take to the streets along with their women and children to save their land and homes from an imminent devastation that was being un­le­ashed upon them by the mining firm and the Sindh government. The veteran leader said that rulers and bureaucracy were only interested in plundering the resources of the area without addressing genuine concerns of the inhabitants of the areas where mega projects had been launched. He warned of ‘dire consequences’ if the genuine concerns of people were not addressed. Mr Palijo urged the rulers to make wise decisions to secure the future of the country and save it from international conspiracies being hatched to advance different agendas in the obtaining geopolitical situation. He said that Sindh was facing multifaceted problems including the deepening water crisis. Sindh’s water share was being ‘stolen’ but rulers had failed to take up the issue at proper forums, he said. He said the long march was aimed at creating awareness among masses about the ill-conceived policies of rulers. Advocate Wasand Thari, general secretary of AT, said that Tharis were protesting peacefully in order to protect their land and centuries-old homes, graveyards, mosques, temples, environment, ecology and heritage from destruction. Ms Zahida Shaikh of Sindhyani Tehreek said the reservoir would cause widespread devastation in the arable area of Thar. She appreciated the village women who had been protesting alongside their men to save their land. The party workers, including women and children, had started gathering in Islamkot town to participate in the long march beginning that day. Earlier, Mr Palijo visited the hunger strikers’ camp set up by villagers of Gorano and other settlements adjacent to it who were protesting against the reservoir project outside the Islamkot press club.